My kitchen smells of garlic, I mean really smells of garlic. There is a huge bunch of wild garlic in a jar, the wild garlic pesto has just been made and now the wild garlic caldo verde is on the go. 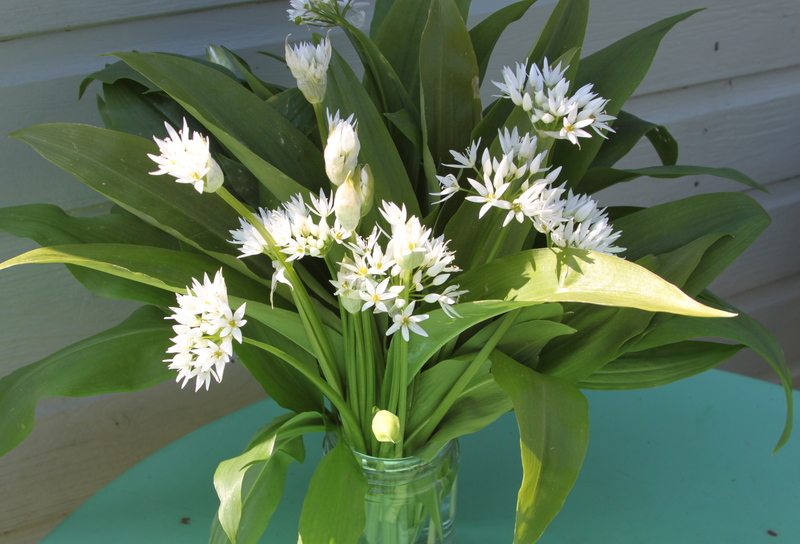 Wild garlic and local salami pizza to follow…. phew, I imagine I might smell as much as my kitchen right now. The roadsides, hedgerows and woods around here are now full of wild garlic and the heady oniony aroma ranges from a gentle whiff to a full on garlic breath pong. Hundreds of pointy green leaves cover the ground and the buds are fat and papery, any minute now the white flowers will explode bringing with them a sight (and smell) particular to our Spring. Should you decide to pick a little to take home there awaits before you a choice. A light and fragrant broth or perhaps a pungent stir fry, the leaves adding both flavour and colour. A little shredded, softened in butter and added to some mash is a new, unauthentic I admit, take on colcannon. With peas and stock you get a new petit pois a la francais. The caldo verde I am making is a version of the Portugese soup with chorizo and potatoes – here the wild garlic replaces the usual cabbage. I have tempered this wild garlic pesto slightly with parsley, rather than diluting the flavour, I think it enhances it. This version still has a wallop of flavour but is not so mouth puckeringly strong you don’t want to finish it. It is amazing with pasta but also try spreading it on some lightly toasted sourdough – a real treat with drinks this long and hopefully sunny weekend. 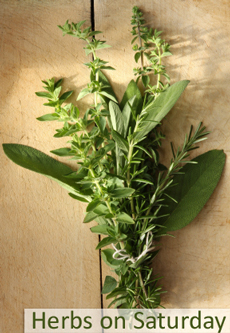 You can do this in a mortar with a pestle or a small food processor. Whizz or pound the wild garlic, parsley, pine nuts, parmesan and olive oil. Don’t process too much as it is nice to have a bit of texture to the pesto. Add a good pinch of salt and some pepper, taste and adjust any seasonings to taste. You may like to add a squeeze of lemon juice just before serving. This amount would be enough for pasta for 4. 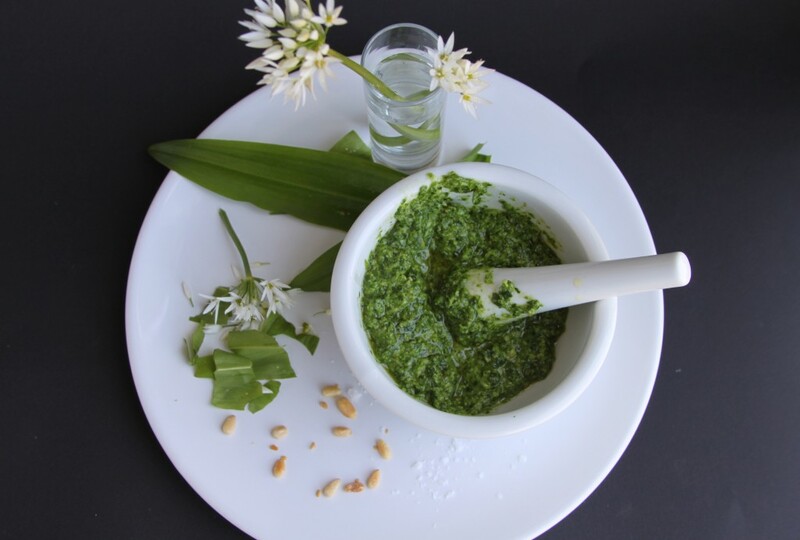 I have entered this wild garlic pesto into Herbs on Saturday recipe sharing blog, check it out for lots of wonderful seasonal ideas. I think the idea of a caldo verde with wild garlic is a great one, and perfect for this year, when it should be summer, but feels more like autumn. Thanks for the inspiration, I’m going to try this. I am totally taken with wild garlic at the moment, I have just posted a chicken and ham recipe using it too. Pesto is a great idea, I’ll just have to omit the parsley, my one hate ingredient! Thanks for the idea. Thank you, I will check out your chicken and ham recipe too. How beautiful does this look? I adore wild garlic!